Stock Flowers matthiola incana are garden flowers that are in the Brassica family which includes cabbage and kale. Called by different names over the years such as Garden Stock, Ten-week Stock, and Gillyflower, these plants are native to the Mediterranean area of Southern Europe. Their Latin name pays homage to Pietro Andrea Mattioli, a sixteenth century doctor and botanist. These flowers with their sweet clove-like scent reminiscent of Carnations have been popular in the gardens of Europe since Victorian times. They were brought to America by Thomas Jefferson, who in addition to being one of the founders of our country, was also an avid gardener who introduced many European plants to the United States. These are lovely plants which grow to an average height of 18 to 24 inches on woody stems. The blooms are white, pink and purple on grayish green foliage. They like cooler weather for blooming and make excellent flowers for cutting. Depending on your location and climate, they may bloom from spring to fall, or from fall to spring in the south. Also, depending on your climate, they may be considered an annual, perennial or biannual. Stock flowers are easy to grow from seed. The will readily re-seed themselves in the garden but can be started from seeds indoors as well. Start the seeds six to eight weeks before the last frost date in your area, Place the seeds on top of the starting mixture and press them into the mixture lightly. 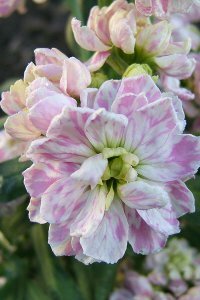 Do not cover as they need light for germination which usually takes seven to twenty-one days. Water from the bottom and keep the soil warm with a seed-starting mat set to 60-65 degrees F. Established plants will withstand light frost but should be protected if below freezing temperatures are expected. In areas with mild winters, the plants may be set out in the fall for late-winter and spring blooms. They do well in full to partial sun and are perfect for those areas that are shaded by trees in late spring and summer but receive full sun in late winter and early spring. Stock does well in a border or with bulbs where they can help mask the spent bulb foliage. Plant them eight inches or so apart for best results. They also do well in containers such as flower boxes and make a good selection for cut flowers, simply cut the stems at an angle, remove any leaves below the water level in the vase and feed them with any cut-flower food.